Most aspects of running a business have some legal consequences. Whether your business is just starting up, expanding, or winding down, you must comply with a number of laws & regulations that govern your business. Every type of business has unique starting and operating requirements. 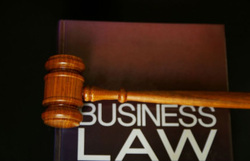 Some of the legal issues you will have to address include business legal structure, tax identification, registration of State and local taxes, business licenses, employee responsibilities, contracts, and many more legal issues. The Law Offices of Normay W. Jones looks to represent small to mid-size businesses. Our goal is to serve its clients by directing them to the best legal choice for their business. We want to protect your interest as well as lessen the burden the costs of the government regulation can put on a business especially small businesses. What type of business organization is appropriate for your business? As a business owner, you will face choosing among different formations to starting or running your business. Most business owners look for the following when deciding to form a business; 1) protection against being personally liable for judgments against the company, its debts, and so on; 2) the ability to transfer ownership; 3) a simple workable management structure; 4) low organizational and administrative costs; 5) an ability to do business without complications in more than one state; and 6) an ability to take advantage of tax laws and keep taxes as low as possible. A person who does not formally create a business organization and who is engaging in business for him/herself is a sole proprietorship. Many small businesses operate as sole proprietorships. A sole proprietorship is not a separate entity from the owner and a sole proprietor directly owns the business and is directly responsible for its debts. A non-corporate business formed with State governmental approval whose owners actively participate in the organization's management and are protected against personal liability for the organization's debts and obligations. The limited liability company is a hybrid legal entity that has both the characteristics of a corporation and of a partnership. An LLC provides its owners with corporate-like protection against personal liability. However, it is usually treated as non-corporate business organization for tax purposes. The net profits or losses of the corporation pass through to its owners. An "S-Corporation" is a regular corporation that has between 1 and 100 shareholders and that passes-through net income or losses to shareholders in accordance with Internal Revenue Code, Chapter 1, Subchapter S. Corporations must meet specific eligibility criteria, and they must notify the IRS of their choice to be taxed as an S-Corporation within a certain period of time. An organization formed with state governmental approval to act as an artificial person to carry on business (or other activities), which can sue or be sued, and (unless it is non-profit) can issue shares of stock to raise funds with which to start a business or increase its capital. The corporation's liability for damages or debts is limited to its assets, so the shareholders and officers are protected from personal claims, unless they commit fraud. The choice of how your business is organized legally will make a difference for you. You can get most or all of these features in most type of business organizations but you may have to weigh one factor against another. If you are looking to start a business you should reach out to an attorney to assist you with the most appropriate business formation for you. We at the Law Offices of Normay W. Jones can assist you with these issues so please contact us in regards to assisting you with your needs for your business.